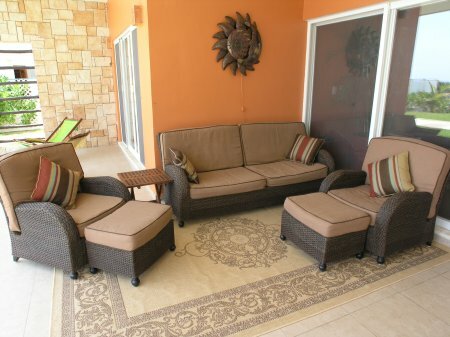 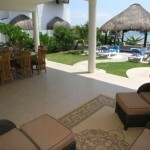 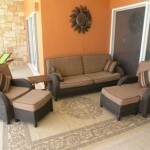 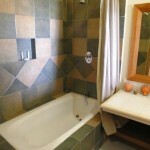 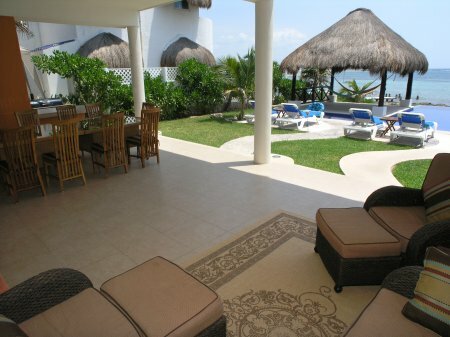 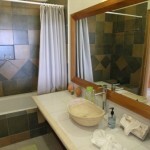 Villa De Valhalla is a perfect choice for large families or groups vacationing together. 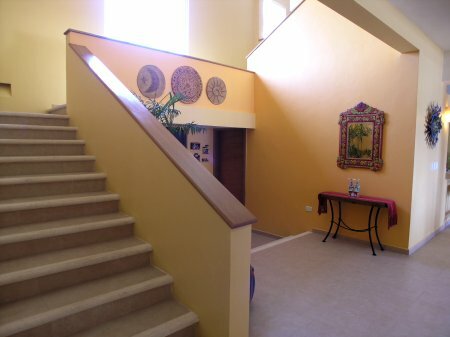 This gorgeous 6,900 sq. 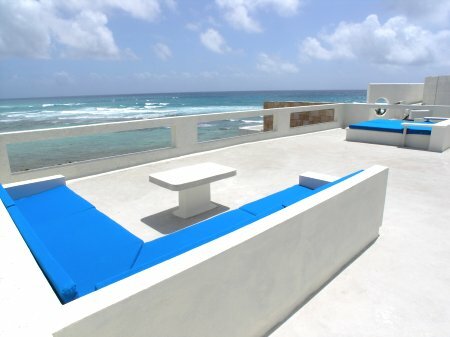 ft. villa has plenty of space inside and out for large groups gathering for dining, swimming and tanning, even stargazing on the rooftop observation deck. 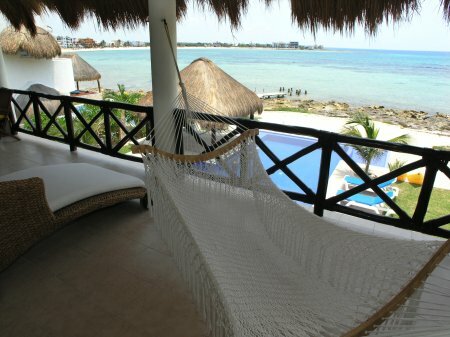 Rooms with a view aptly describe this magnificent villa, which overlooks the Caribbean from the south rim of Half Moon Bay in North Akumal. 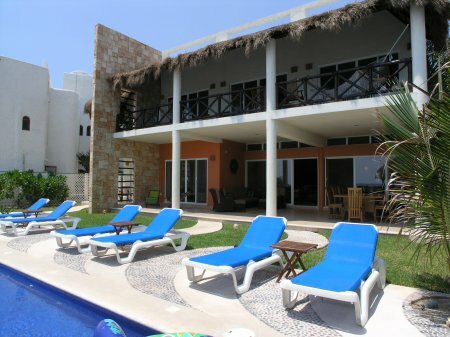 The owners have thought of virtually everything to facilitate family and group vacations; first by putting all the bedrooms on the ocean side of the house with nearly equal interior space. 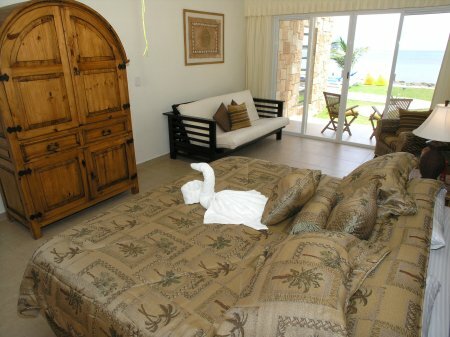 Now there won’t be any arguments over who gets the best room. 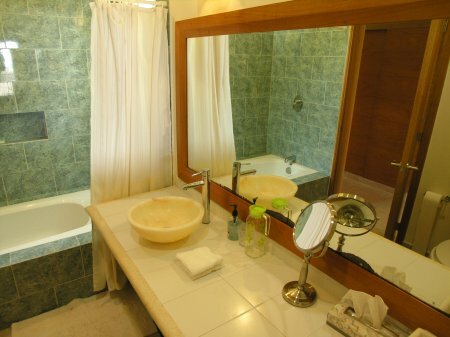 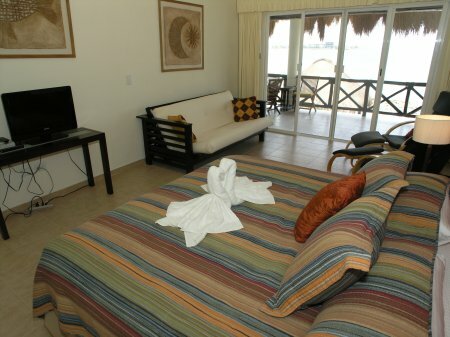 And each bedroom has a lower level pool/ocean patio or a second level ocean view terrace, plus a sitting area, and a private bathroom, very nice! 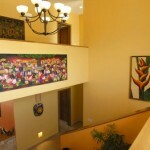 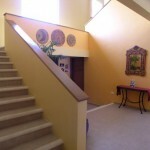 Four bedrooms are on the upper level and two on the lower level. 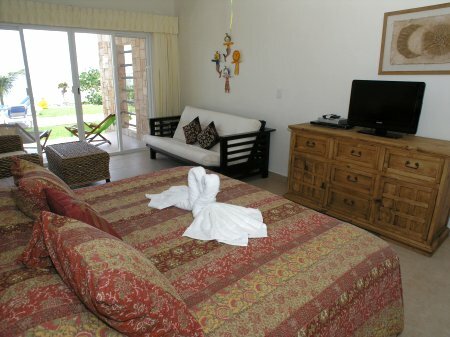 One of the bedrooms on the lower level is specially designed for the needs of anyone facing physical challenges; the seamless design includes wider doors and a wider shower area with removable ramps for easy access. 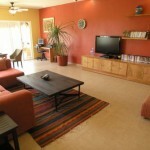 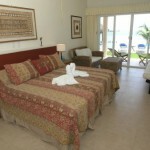 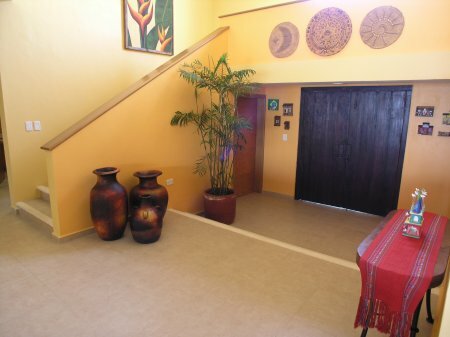 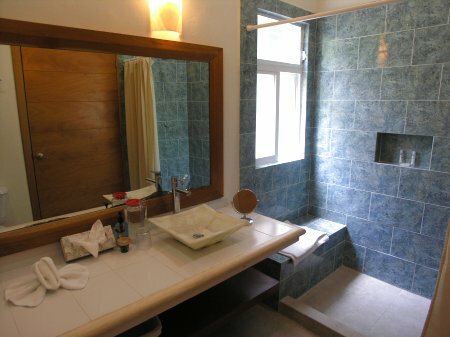 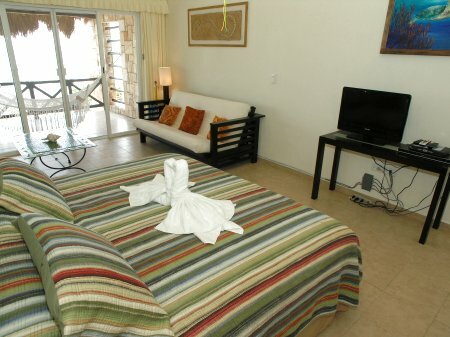 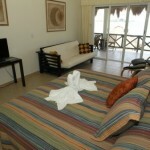 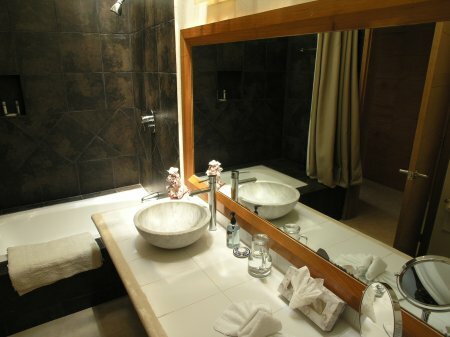 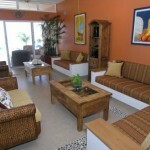 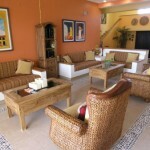 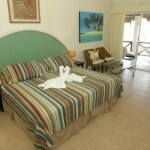 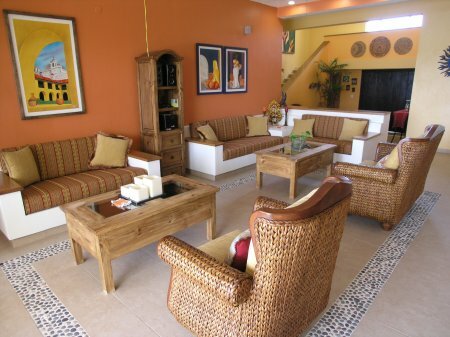 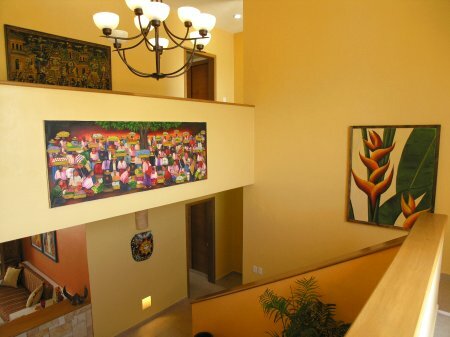 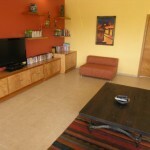 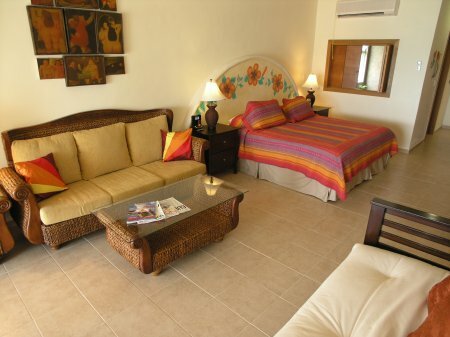 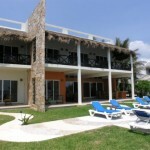 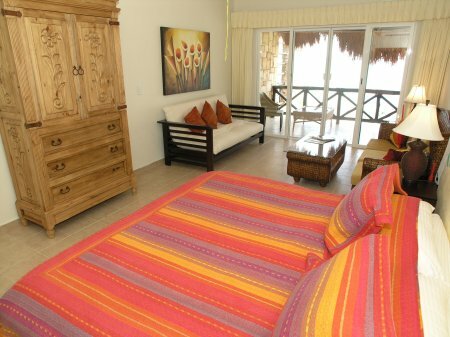 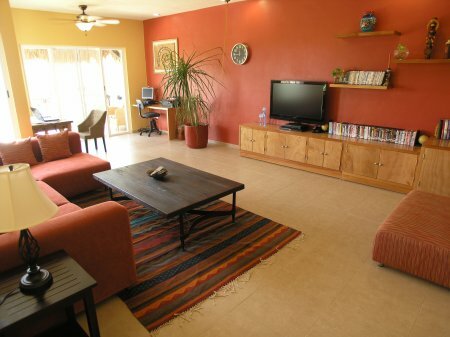 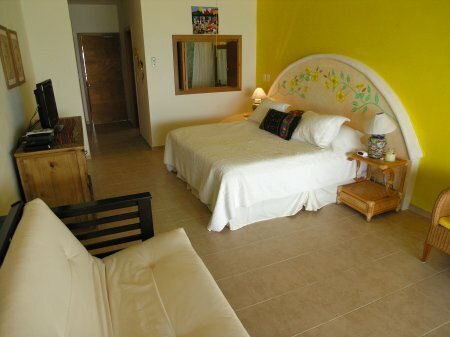 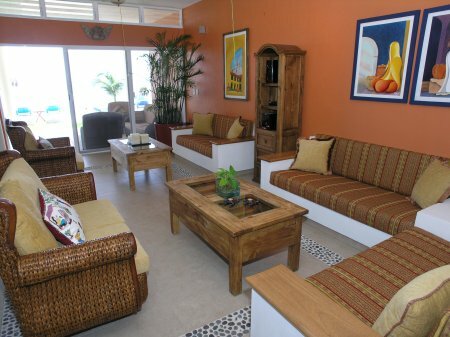 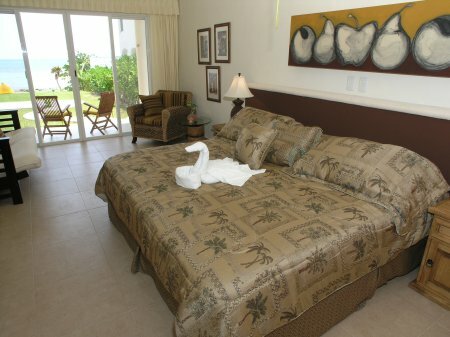 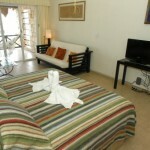 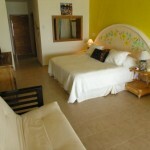 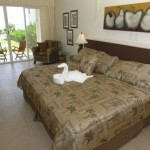 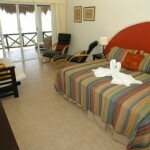 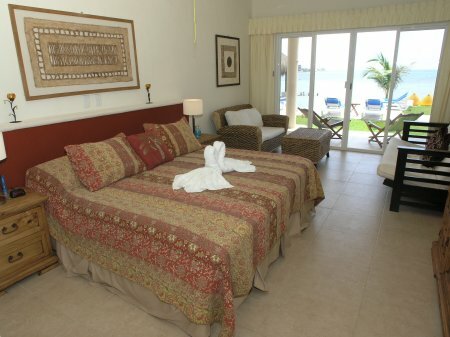 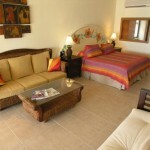 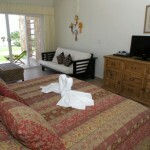 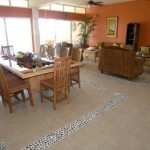 The main living areas are spaciously elegant and furnished in a modern, tropical style. 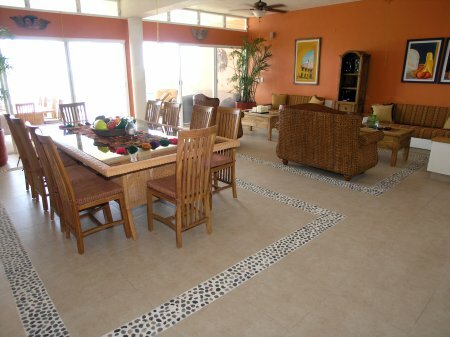 The main living area includes the living room, dining room and kitchen. 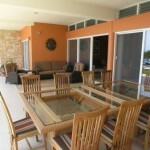 The dining and living rooms open to the seaside patio, which is nicely furnished with outdoor dining and living spaces. 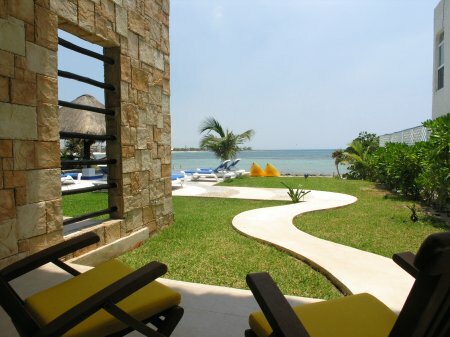 The glass sliders are intentionally wide so they can be rolled back uniting the inside and outside, allowing the guests to take full advantage of good weather. 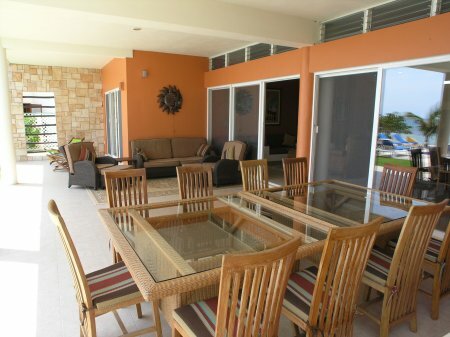 There is plenty of seating for everyone both inside and outside the villa. 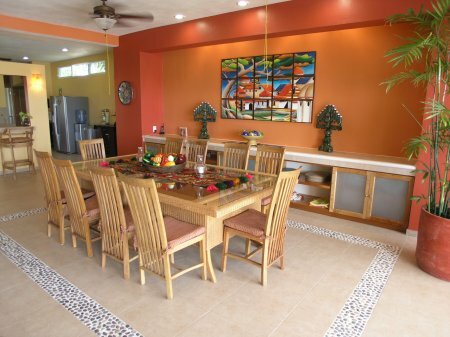 The two large dining tables can be united either inside or outside for full group dining. 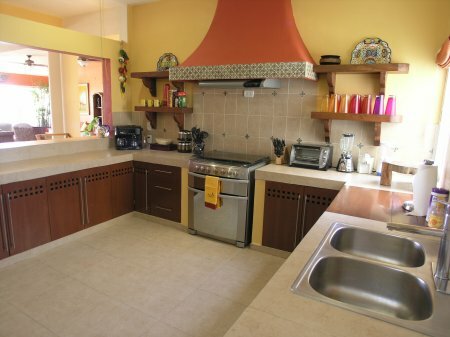 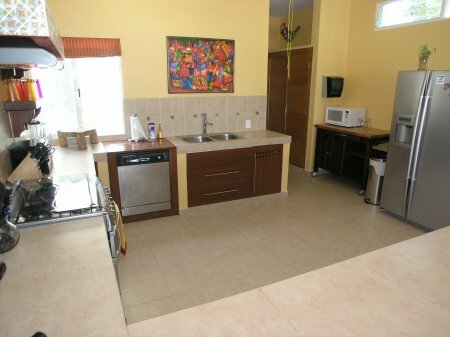 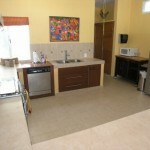 The kitchen is fully equipped and thoughtfully laid-out for preparing large meals. 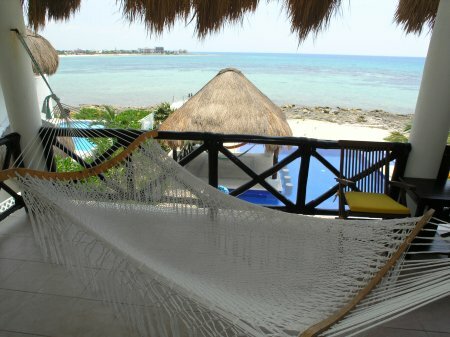 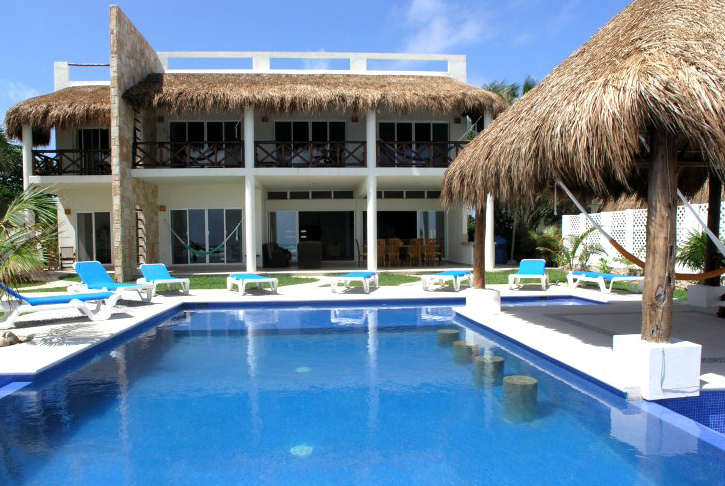 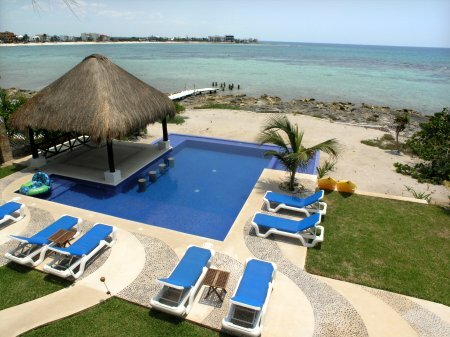 The pool area is where you will spend much of your time, enjoying the view and breeze, tanning in the chaise lounges, splashing in the pool, and swinging in a hammock under the shade palapa. 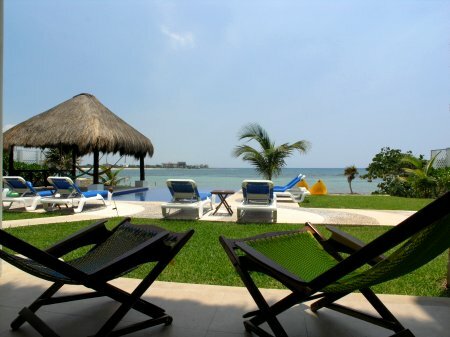 Considering that there will most likely be a mix of adults and children, the pool has a generous shallow area and built-in stools at the edge of the poolside shade palapa. 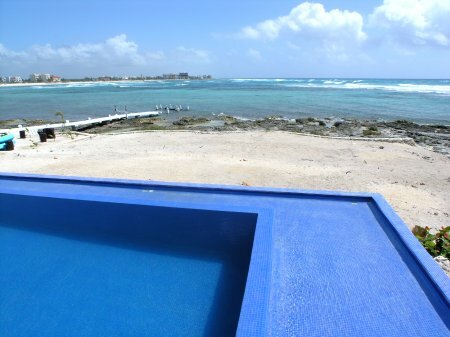 Kids can frolic to their heart’s content while the adults enjoy their favorite beverage right next to them, perched on a “swim-up” seat (please use only plastic in or around the pool). 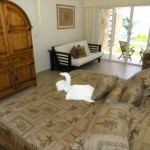 The view of Half Moon Bay is spectacular from this location and sunrises are a sight to behold. 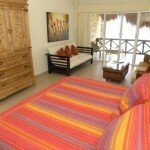 You’ll find that even the sunsets normally light up the sky to the east making twilight time doubly enjoyable. 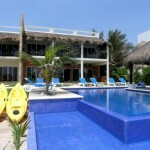 Farther out from the pool is a sandy sea front tanning area and 2 kayaks for cruising Half Moon Bay when seas are calm. 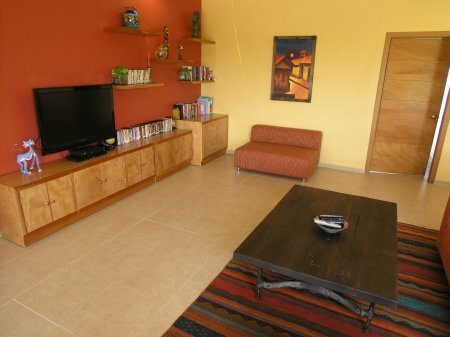 Upstairs is the entertainment/media room equipped with a 33 inch flat screen TV with satellite service, DVD player, broadband Wi-Fi wireless Internet with whole house coverage (Ethernet ports are in each bedroom, just in case), plus plenty of comfortable seating with sofas and chairs. 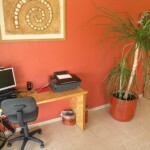 There is also a workstation with a laptop computer provided for checking your email, plus a copier, scanner and printer. 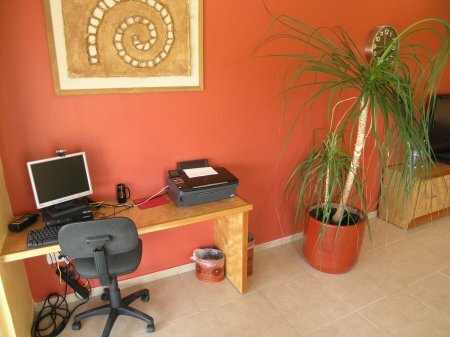 If your laptop is wireless enabled you can be online anywhere in the house. 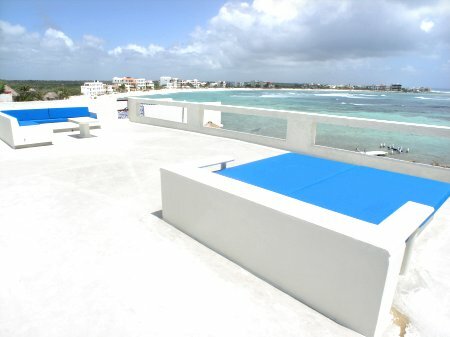 The rooftop deck is literally the crown to this tropical castle. 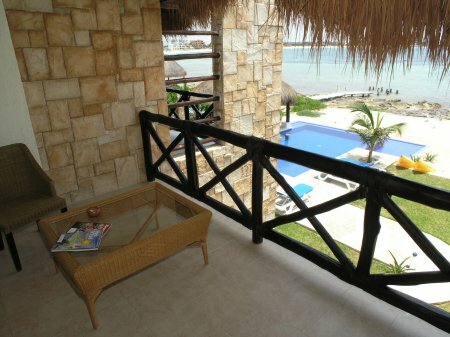 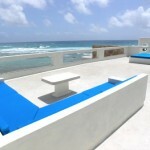 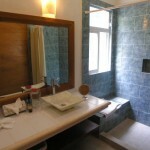 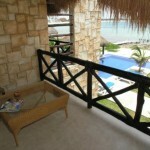 It has a built-in padded sofa with a table, and a king size lounging bed, both facing the sea and the views. 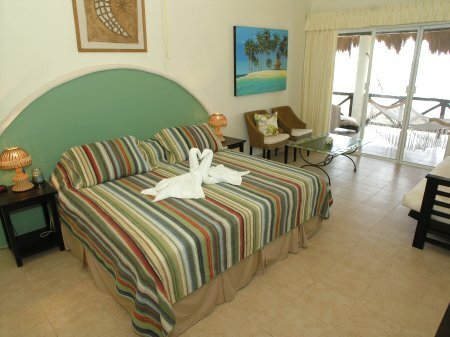 The 360° panoramic view covers Half Moon Bay, the Caribbean and the jungle to the west. 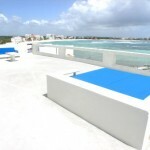 While the rooftop can be hot during midday, at twilight it is perfect for enjoying sunrises and sunsets. 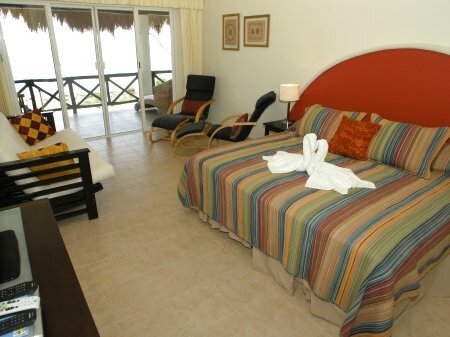 After sundown stargazing and the lights of the coastline are a perfect finish to yet another great day in Akumal. 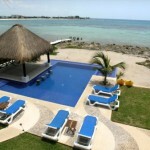 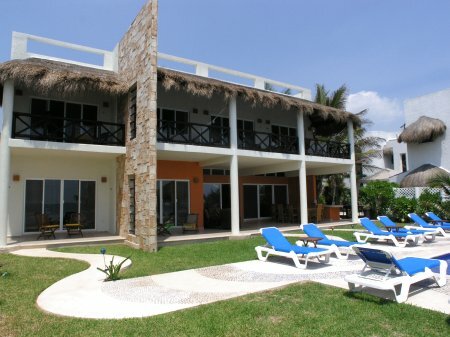 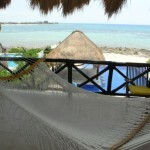 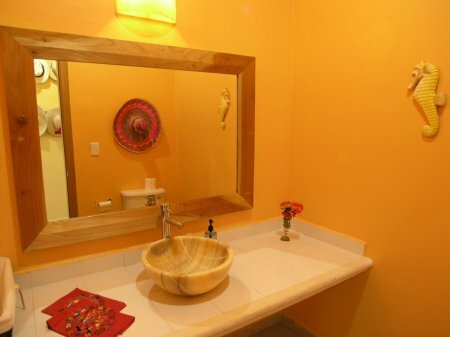 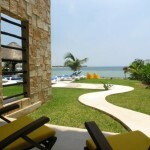 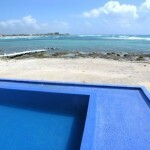 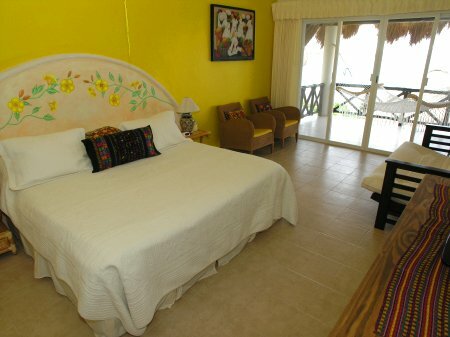 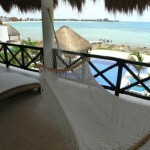 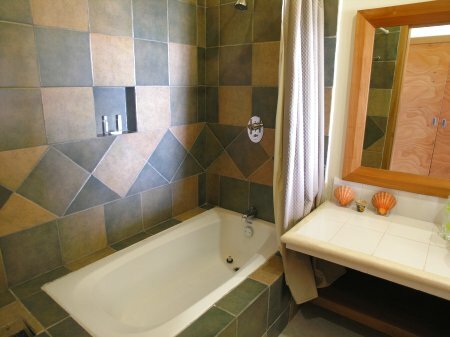 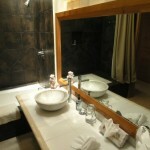 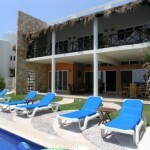 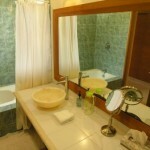 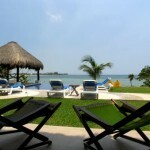 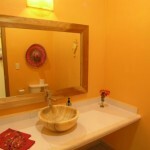 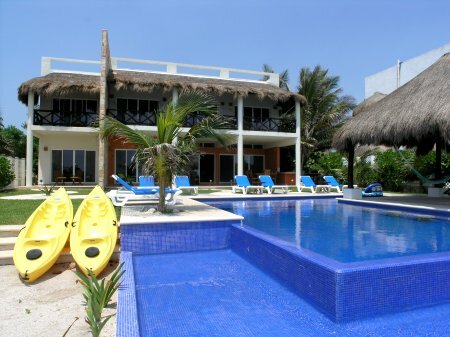 Rates are in USD, per week, for up to 10 people, and do not include the 19% Mexico tax. 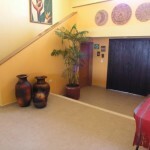 * Add $500 USD per extra person (10 years of age and older) over base 10 persons. 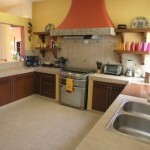 Add $250 USD per extra child (25 months to 10 years of age) over base 10 persons. 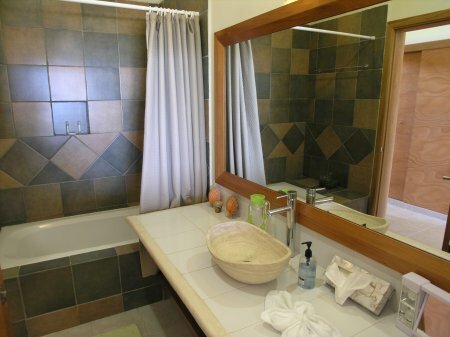 Infants over base occupancy (24 months old and under) are FREE and do not count for the max occupancy. 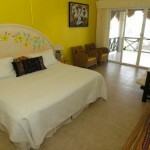 Please add $300 USD fee if you will be having guests visit from outside the villa. 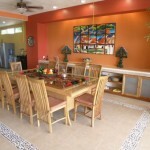 Arrival night dinner applies to reservations of 7 nights or more.